There’s so much happening this July 4 weekend, a festive meal to take on the road could be the answer to your action-packed holiday. To make good on the classic picnic lunch, there are a few basic factors to remember. Don’t pack anything slippery, melty or watery. Think finger food, think plastic utensils and think easy clean-up while you run the antique show gauntlet between Bellevue and Ketchum. I’m from Hawaii, so when the temperature gets above 70 degrees, I get a hankering for comfort foods with Asian flavors. It seems like you can slap most anything between two pieces of bread and call it delicious. For a twist on an American favorite, consider substituting a hamburger patty with succulent pulled pork. Kalua pork is a Hawaiian staple. While traditionally served with shredded cabbage and white rice, it makes for one heck of a fresh take on filling. Our straight-from-the-islands recipe only has three ingredients: liquid smoke, sea salt and pork shoulder. For our take on a national Independence Day side dish, whip up some Thai coleslaw for the ultimate topper on your Kalua pork sliders. Slow-cook a pork shoulder the day before your picnic, shred the meat into a sturdy Tupperware and along with your buns and sweetly sour coleslaw, you’ve got a crowd-pleasing picnic entrée. For a healthier starch accompaniment, say yes to sweet potatoes. Cut a few white yams into wedges, leaving the skins on, and toss with cumin, salt and the tiniest bit of oil. Roast them at 400 degrees for about 45 minutes or until you can easily pierce the fries with a fork. They taste great cold, especially dipped in honey mustard. Another Hawaiian favorite is cold edamame. Boil edamame pods according to package instructions. Refrigerate and toss with sweet chili sauce (you can find it in the international section at supermarkets) before serving. Good luck stopping at one: this pupu is downright delicious. In keeping with the pan-Pacific theme of our menu, the “piece de resistance” is a mixed-berry butter mochi. Mochi is the Japanese answer to cake: you use the same basic ingredients, but rice flour is substituted for regular flour. The taste is similar, albeit a bit chewier. In keeping with the holiday, feel free to turn your mochi red and blue with strawberries and blueberries prior to baking. 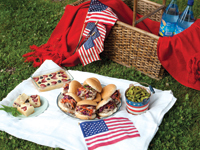 America is a melting pot and what better way to honor that than switching up the contents of your picnic basket? Variety is what keeps this country current—Happy Fourth! Cut deep slits into the pork on both sides and rub it with salt. Pour liquid smoke all over the meat. About 1/2 of the bottle should be used. Make sure the meat is flat in your crockpot before you pour enough water into the pot so that the bottom of the meat is barely covered. Cover and cook on low heat for 4-5 hours until the pork looks cooked and you can shred it. Before it completely cools, use a fork to shred the pork. Cover and refrigerate when it cools to room temperature. Reheat the pork before you stick it in your picnic basket so it’s at room temperature by the time you serve it. Combine cabbage and carrots in a large bowl. Toss with oil, sugar, soy sauce, vinegar, jalapenos, lime juice and Sriacha. Refrigerate. Top with cilantro and peanuts before serving, if desired. Beat butter and sugar in a mixing bowl. In a separate bowl, combine water and evaporated milk. Add liquid and the rest of ingredients to the bowl and whisk until smooth. Grease a 9-by-13 inch pan, pour in batter, top with fruit if desired and bake at 350 degrees for an hour. Cool completely and cut mochi into squares with a plastic knife.